We know rents are soaring in large swaths of Western Washington, but we don’t often hear directly from families who are struggling to stay housed. Wanting to share their voices, I put out a call for stories. I was connected with Sahro Farah, a single mother of five children. I was surprised when Sahro told me her rent was going to more than double, from $550 to $1,150 a month. I’d heard of big hikes, but this was really dramatic. I was even more shocked when I saw the conditions at her South Seattle building. Heaters, windows and appliances are broken; black mold and pests are rampant. I connected Sahro with the Tenants Union of Washington, an organization that works for housing justice. Firesteel volunteer Gemma Amos and I also documented the many code violations in the building, and made the video you see above. Unfortunately, Sahro and her children don’t have a lot of options for housing. Sahro works two jobs as a home health care assistant, but she can’t afford rising rents, even in Seattle’s least-expensive neighborhoods. As the city has grown, the supply of homes — and especially affordable homes — has not kept up. In Seattle there are only 56 affordable and available units for every 100 very-low and low-income families who need them. As immigrants and refugees, Sahro and her neighbors are very vulnerable. Some are recovering from traumas they experienced in their home countries, and I’m appalled that they are being re-traumatized in their new country living in these conditions and on the edge of homelessness. The people I met in Sahro’s building want what all of us want: Opportunities to work, raise healthy families, and be active in their community. This all starts with a safe, stable home. Sahro told me that she and her children were struggling to sleep as they worried about the possibility of becoming homeless. I’ve also had a hard time sleeping thinking about the long-term effects that unhealthy living conditions and the stress of housing instability may have on Sahro’s kids. When students experience homelessness, they struggle to learn. Many fall behind in school, and are less likely than their housed peers to graduate. Our current housing crisis has the potential to create long-lasting problems for children, and we need to do something about it. 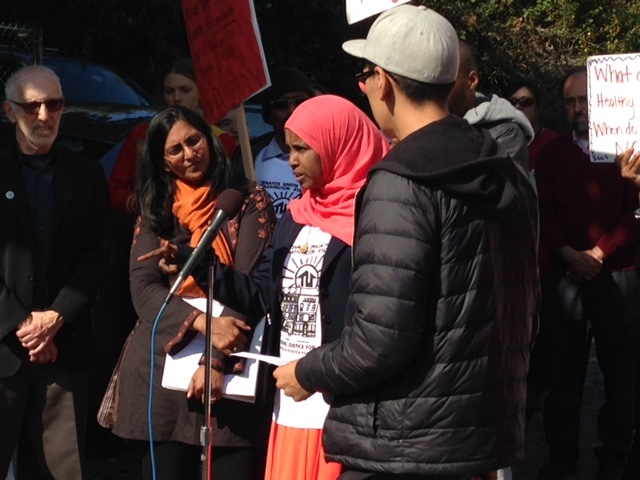 Sahro shared her story with reporters at an Oct. 1 press conference organized by the Tenants Union and Councilmembers Kshama Sawant and Nick Licata. Yesterday something amazing happened. Advocates from the Tenants Union, as well as Seattle City Councilmembers Kshama Sawant and Nick Licata, called a press conference at the decrepit building. 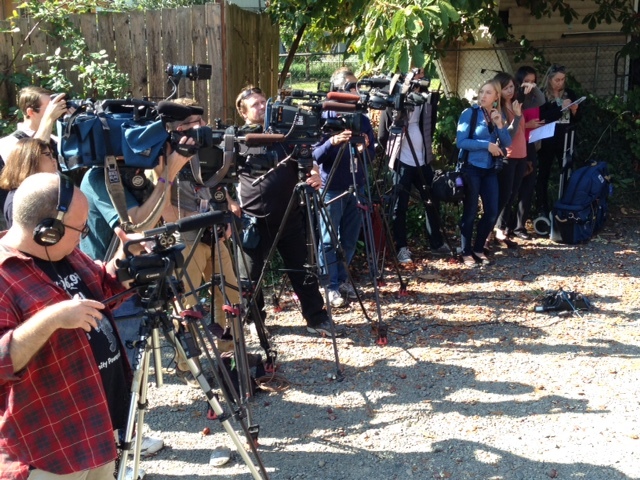 Many journalists showed up to hear from the tenants and document their living conditions. The story made the front page of the Seattle Times, and was also featured on KIRO-7, KING-5 and other outlets. Journalists captured the stories of Sahro and her neighbors. After the press conference, the reporters toured the building and documented the deplorable conditions. As I write, more than a dozen staff from the Department of Planning and Development are inspecting the building for code violations. The Tenants Union is organizing Sahro and her neighbors, and connecting them with legal representation. The Low Income Housing Institute has committed to work to find homes for everyone in the building. While this big step toward justice for these tenants is heartening, I know that many, many others are struggling to afford rent and pay for their basic needs. It’s time for our community to enact policies that ensure everyone has the opportunity to live in a safe, healthy, affordable home. Sign up for alerts from the Washington Low Income Housing Alliance, and take action when you receive their emails. Share stories like Sahro’s with your social networks, and engage in conversations about housing and homelessness online and in person. If you live in Seattle, tell the City Council how you feel about Mayor Ed Murray’s plan to address the housing crisis. Rep. Brady Walkinshaw’s website has online tools for making your voice heard.